Fulltext ⋆ 100% Private Proxies - Fast, Anonymous, Quality, Unlimited USA Private Proxy! I am building search enhancement in Drupal 8 site. I have one search server: Acquia search API In the search API fields tab, i set up title, rendered HTML and taxonomy term as fulltext fields and boost them accordingly. 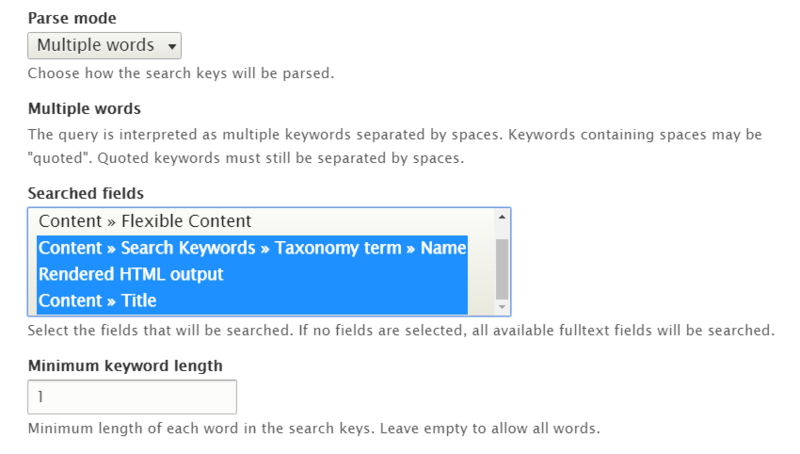 In my search view, i selected three of them as search fields and put the min keywords length as 1. If i search two keywords, it works good like ‘ONE TWO’. If i only select ‘ONE’, it return none result. I’m search trough set of XLSX files for particular phrase (with Windows integrated search) and after some time for another (phrase, files are the same). So I have wait again. I’m using MySQL’s boolean full-text search for my search engine: https://dev.mysql.com/doc/refman/5.6/en/fulltext-boolean.html. When given a search term, I want to search the product’s table’s name and description columns, as well as the product’s color name. The color’s name is in a separate table. Should I create a new column in the product’s table and put all the text I want indexed in there? For example, I add a products.full_text_index column, and dump a concatenation of name, description, and the color’s name in that column? Then do full-text search against that column? UPDATE: Or, instead of a column in an existing table, maybe create a new table to contain all the text that should be used for the full-text search. That table can just have a FK to the products table.